As I write this, it’s technically spring, but you’d never know it by the snow flying horizontally outside my window. 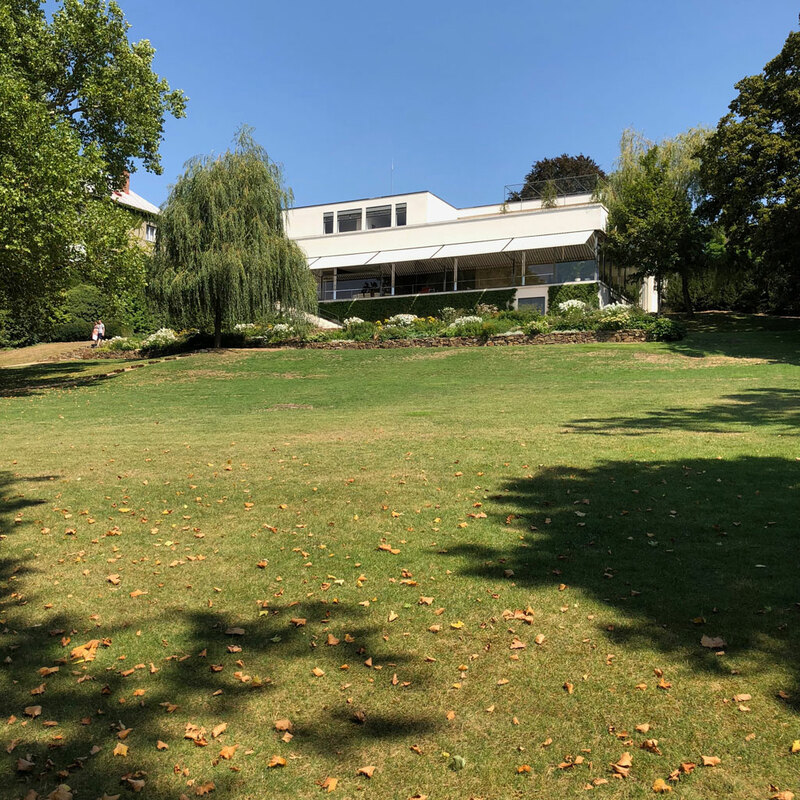 So what better time to remind myself, and share with you, my warm and summery tour of the Villa Tugendhat? 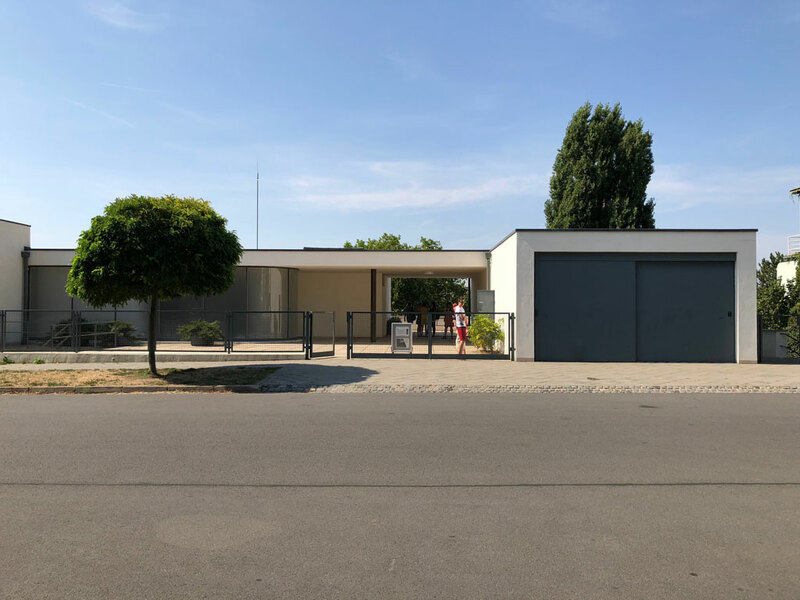 Designed by Ludwig Mies van der Rohe for Grete and Fritz Tugendhat between 1928 and 1930 in Brno, Czech Republic, the house is—according to our guide—the first residence to incorporate a steel load-bearing structural grid. 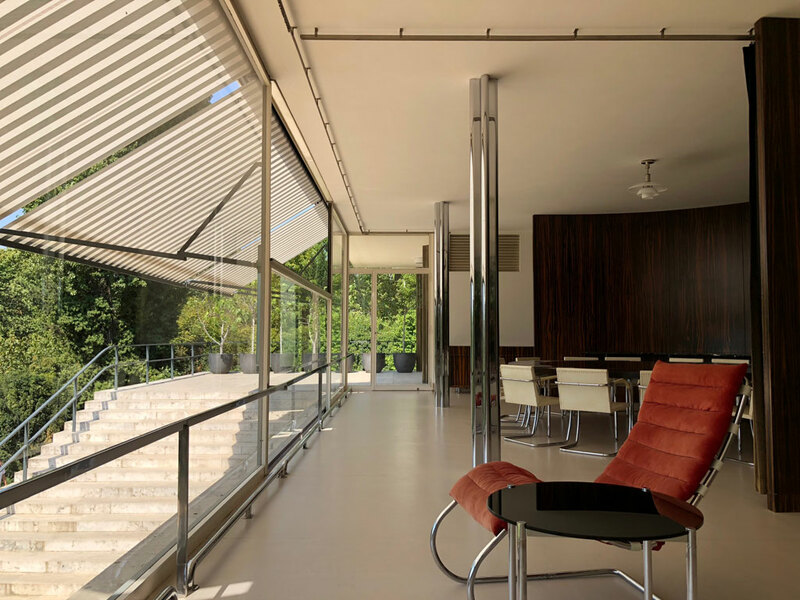 Designed nearly simultaneously to the architect’s better-known Barcelona Pavilion (1929), the house shares many distinguishing features that still inform contemporary residential architecture of the Modern era. The first example of this is its intrinsic connection to the site. Situated across three levels, the large house is entered at the top, at street level, belying its actual size from the get-go. 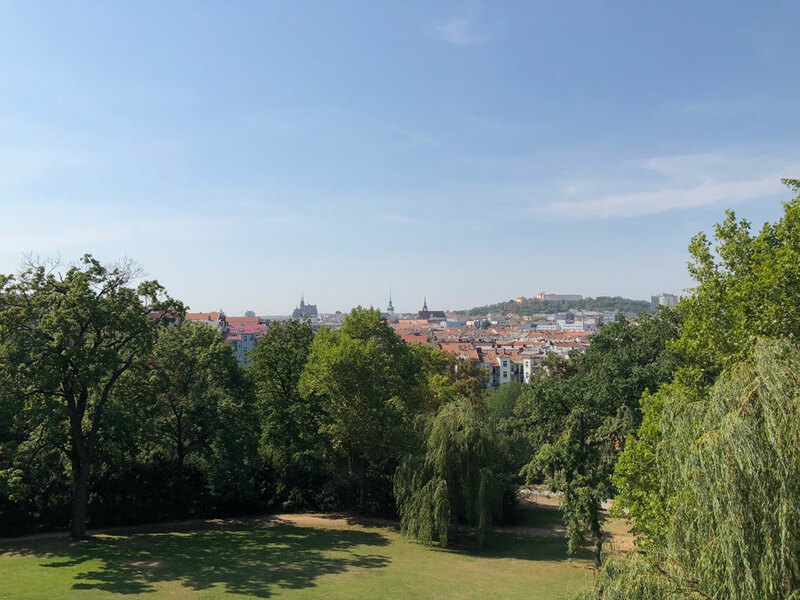 In a seemingly suburban setting near the center of town, the grounds benefit from a coveted and exclusive property parceled and gifted to the Tugendhats by Grete Tugendhat’s parents (and subsequent neighbors). The home is entered sequentially: from street to auto court to low-ceilinged breezeway. I couldn’t help but compare the approach to many Frank Lloyd Wright designs. 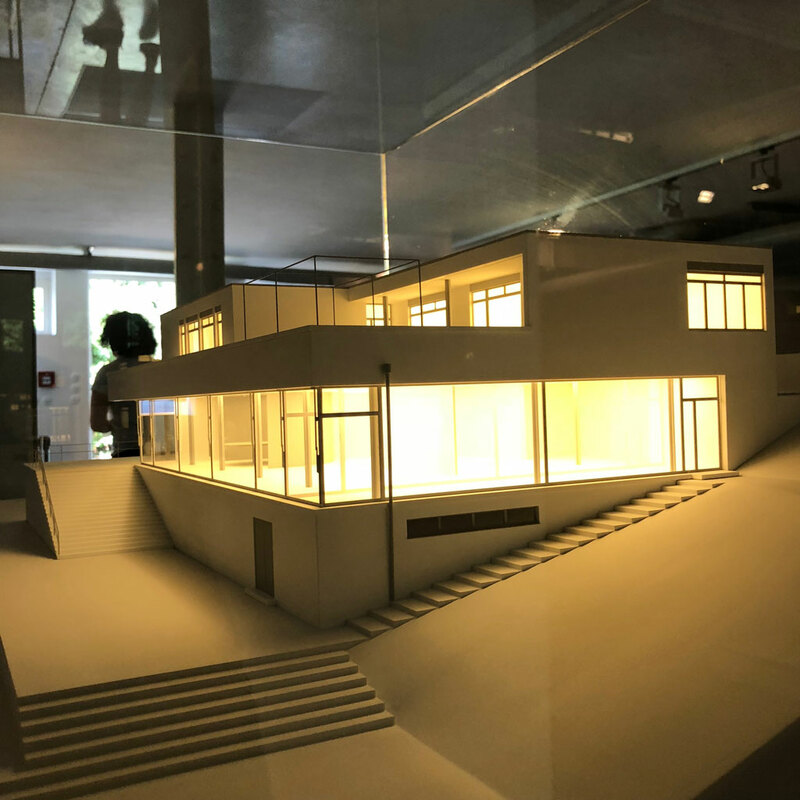 [Side note: This is not surprising when you consider Wright, Mies and Le Corbusier, were all contemporaries in Modernism.] 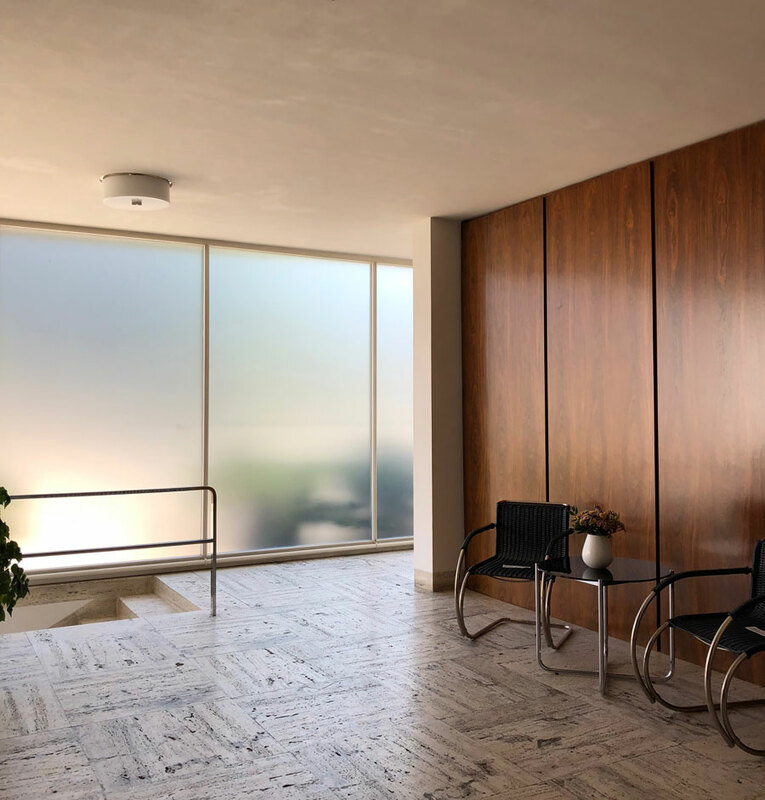 The façade materials of stucco, steel and glass have become almost ubiquitous in today’s “Modern” homes, but imagine the long, low façade set amongst centuries-old homes in 1930! Entering the house feels a little like stepping into a page from Dwell. 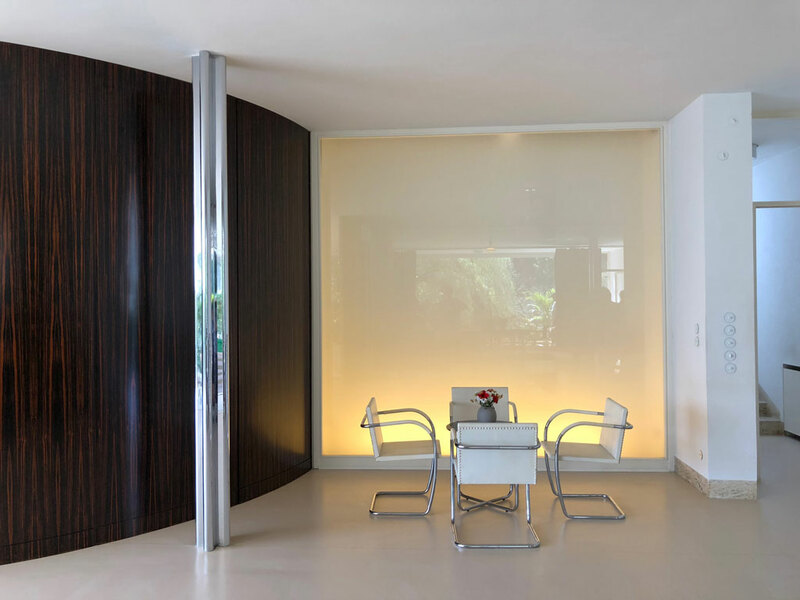 Visitors are welcomed by a full-height wall of wood, surrounded by warm-white plaster, panels of translucent glass, and a field of quarried Travertine. On close inspection, you might notice the 90 year-old age of these materials, but no doubt they remain on trend. The family’s private rooms were on this upper entry level, with most guests only getting as far as the foyer before descending to the (mid) living level on the most graciously curved stair I’ve ever traveled. It is not until you step out from the stair into the main living area that you realize the true scale of the nearly 10,000 square foot home. 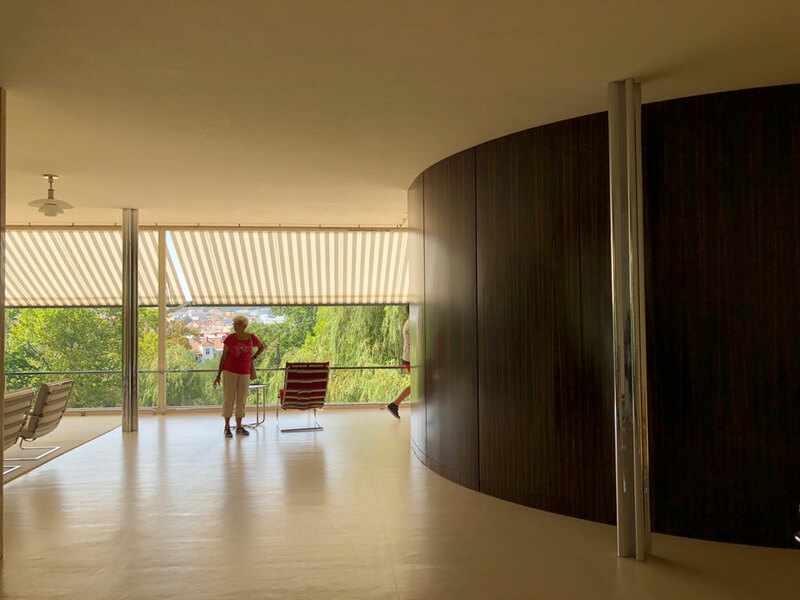 The formal living area is a contemporary “open plan” with more than 2500 square feet, divided in true Miesian fashion by a series of monolithic planes that create space, frame views and define circulation. 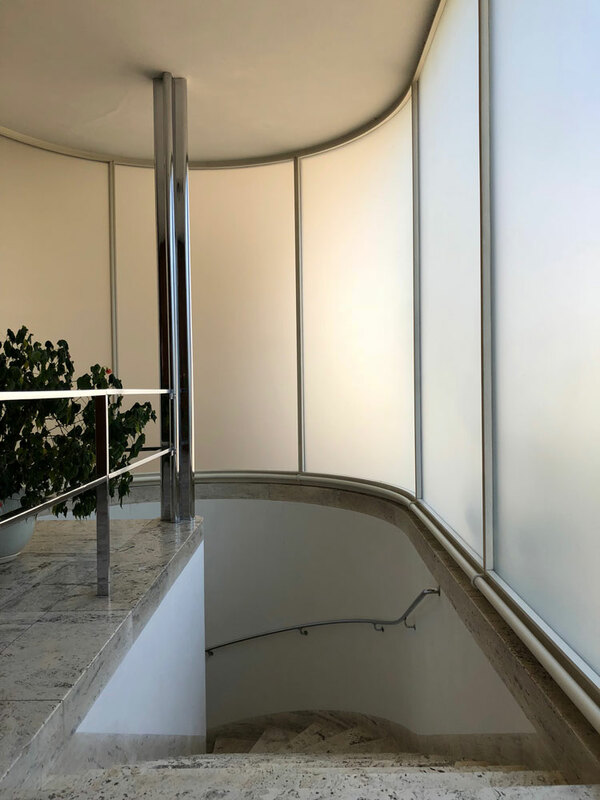 There is a translucent sheet of backlit glass at the base of the stair, an elegant vignette at which to converse or rest. Functionally, it screens the kitchen and service area from the formal living space. 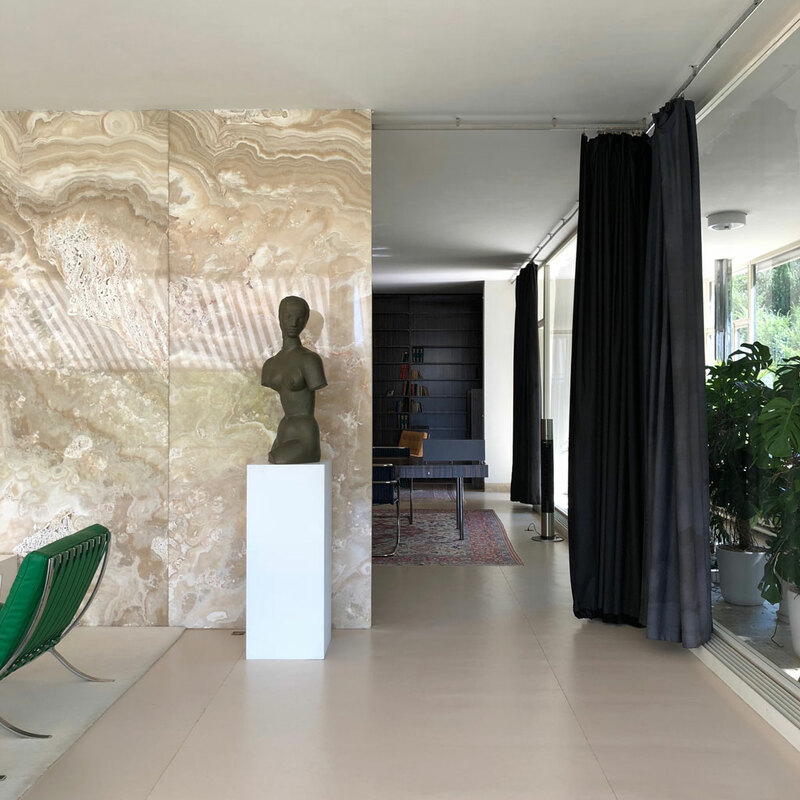 There is the monumental solid Onyx wall separating the warmly sheltered study from the formal sitting area bathed in light and view. 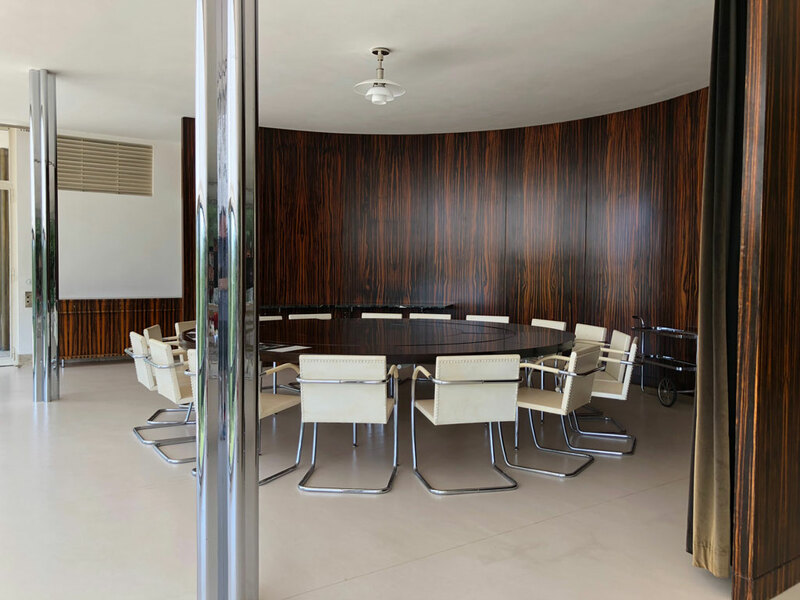 There is the semi-circular partition of Macassar Ebony wood defining the boundaries of the formal dining room and enclosing a custom dining table of radial leaves that seats up to 24. 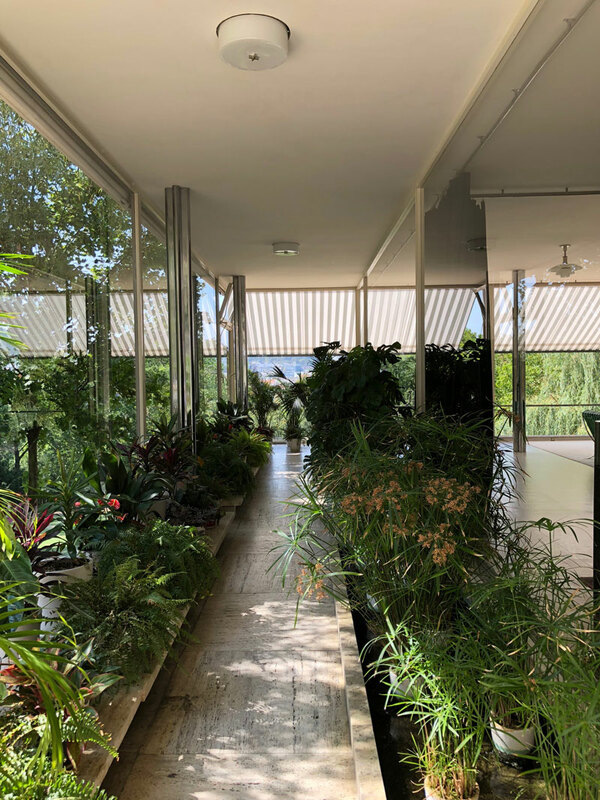 Last, but not least, is the wall of clear glass that separates the living space from a lush greenhouse, approximately 8 feet wide and running nearly the depth of the house, to ensure a verdant view even when the snow is blowing sideways outside. Notably, each of these unique vertical planes is placed independent of the regular cross-shaped steel column grid, distinguishing structure from space. 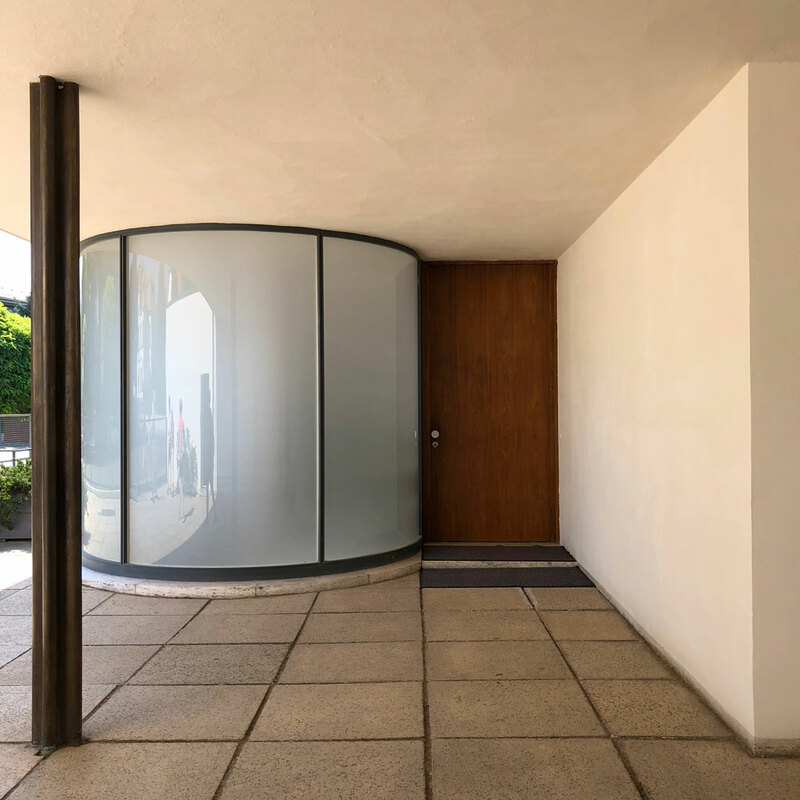 Where textbook Modernist masterpieces like the Villa Tugendhat depart from our current expectations of contemporary “Modern” architecture are most obvious in the separation of formal and informal spaces. 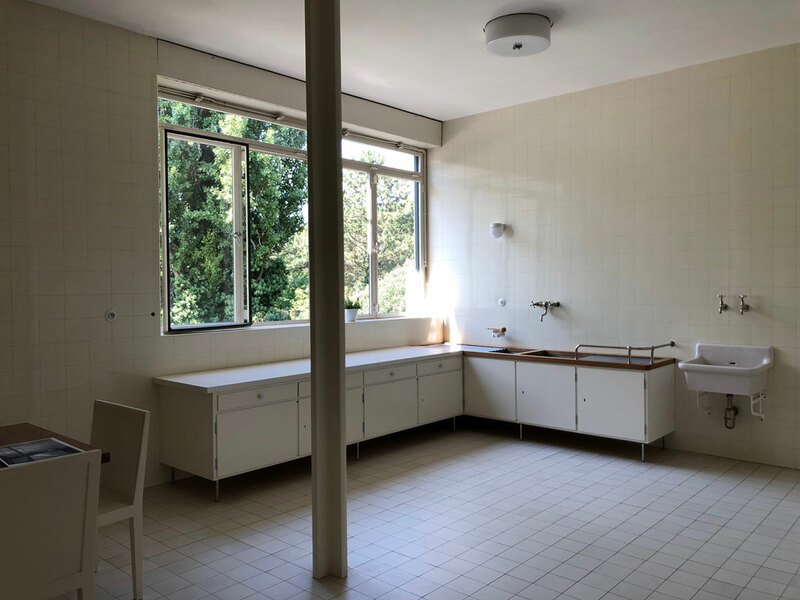 At the Tugendhat, guests were never intended to gather around a kitchen island, let alone see one, and such domestic features were rooted in functionality above all else. We initially saw the floor plan for one huge room with one circular and one free standing wall. We consequently noticed small crosses at approximately five meters distance from one another. We asked,’ What are these?’ Mies answered calmly, ‘Those are iron supports which make up the entire structure.’ At that time there had never been a private house built with an iron construction. You can imagine our initial surprise. We were nevertheless very pleased with the plan. To live in such a home is truly a privilege, as is the ability to wander through and contemplate its complexity and extravagance nearly a century later. It’s this vary ingenuity and aspiration that brings both peril and delight to our world, and a responsibility to appreciate the difference.